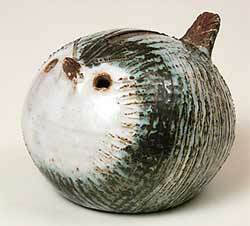 Briglin bird moneybox - 4" (101 mm) diameter, 3⅛" (79 mm) high. Briglin Pottery was set up in 1948 by Brigitte Goldschmidt and Eileen Lewenstein in Crawford Street, in London's fashionable W1 area. Their object was to produce well designed, attractive pots that could be used in the home, and to sell them at affordable prices. Although this concept did not fit well with their chosen address, and despite their style being quite different to that in vogue at the time, the venture was successful. The white-glazed earthenware pots with painted decoration were, as specified, appealing, functional and reasonably priced. Donald Mills, at whose pottery the ladies met, worked with them for the first four years. In 1950, when she married, Brigitte's surname became Appleby - the name she is remembered by. Eileen left Briglin in 1959 to set up her own studio. Both women were active in the forming of the Craft Potters Association and served it for many years. The mark is the word 'BRIGLIN' sometimes in a circular 'Hand made in England'. The painted initials 'AB' indicate that a piece is decorated by Anthony Barson. The pottery closed in 1990. Brigitte Appleby died in April, 2000 and Eileen Lewenstein in March, 2005. You can visit a web site dedicated to Briglin at www.briglin.com.